Start from last week, I needed to prepare lunch for my son who just started JK. No matter how multitasking I think I am, the fact is it is quite mess. It is hard to make the breakfast and cook some fresh lunch for the kids. 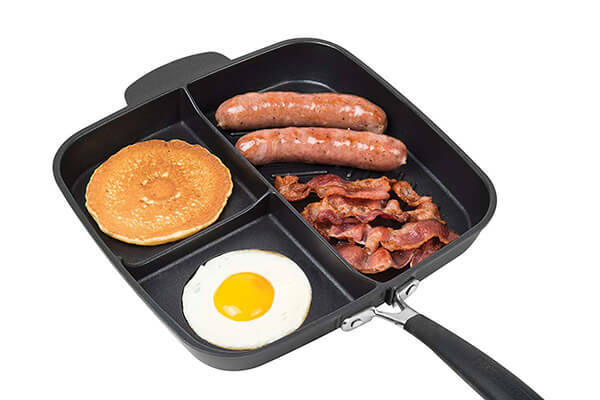 Then I suddenly stumbled upon the divided grill and griddle skillet, it is just perfect for any busy morning. From 2 division to 5 division, you can choose one fits your needs mostly. I got a 4 division one for myself and found it really helpful. And you know what is the best? 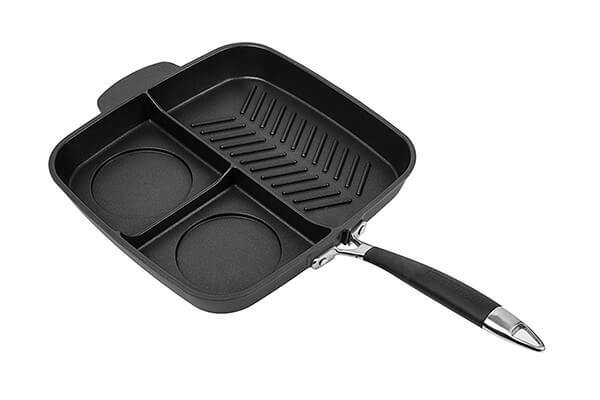 You only need to clean one pan and that is it. Love the design! 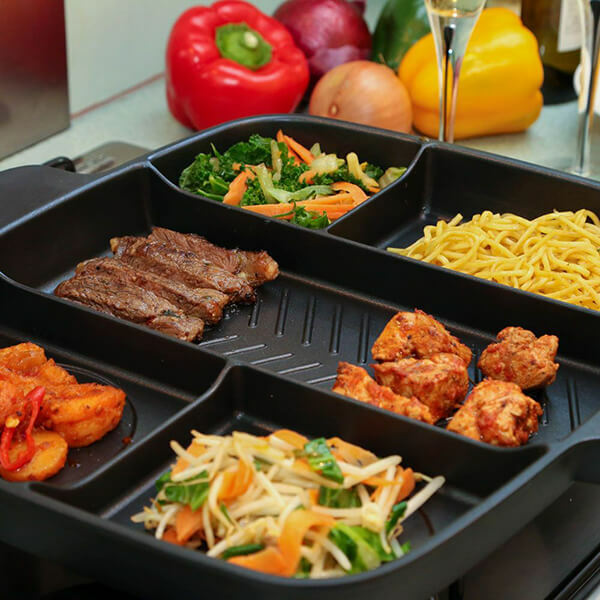 Cook up to five different foods all at once on one burner! Prepare a complete breakfast, big burger meal, full fajitas, or a healthy salmon dinner with veggies. The possible food combinations are endless! 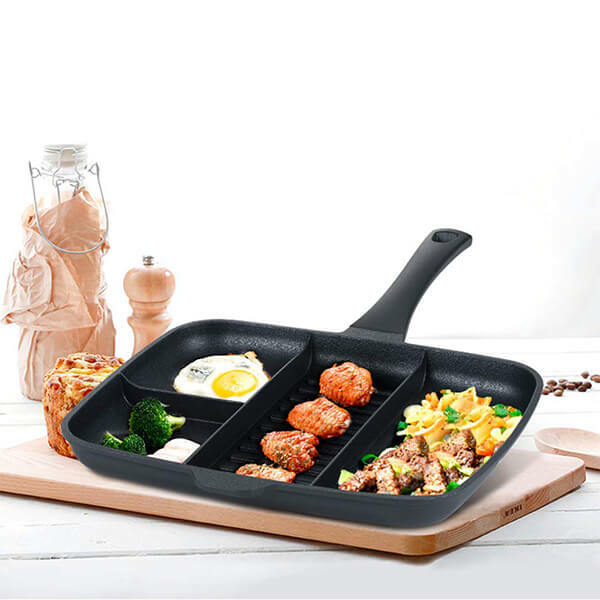 Plus, when you’re finished you’ll have just one pan to clean. 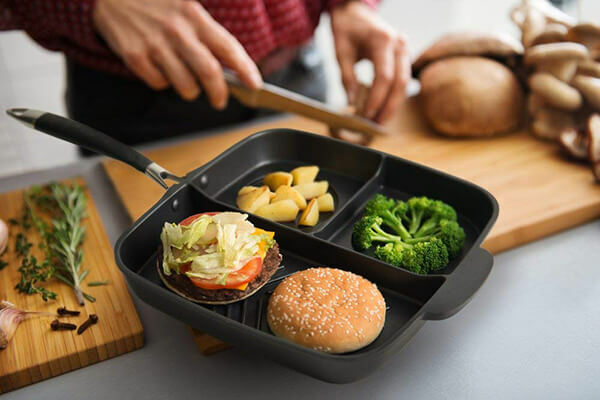 Cook faster, clean less, and still enjoy great meals! High purity Aluminum ore went through 1750 degrees high temperature melting, removing harmful substances and then adding tungsten to do deoxidation treatment. 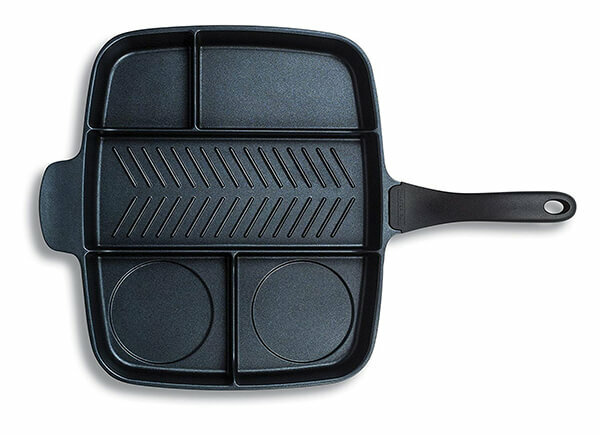 One mould for one pot, making the pan integrated and durable. We have superb design idea from famous European designer usta, aiming to combine practicality, operability and beauty as a whole. 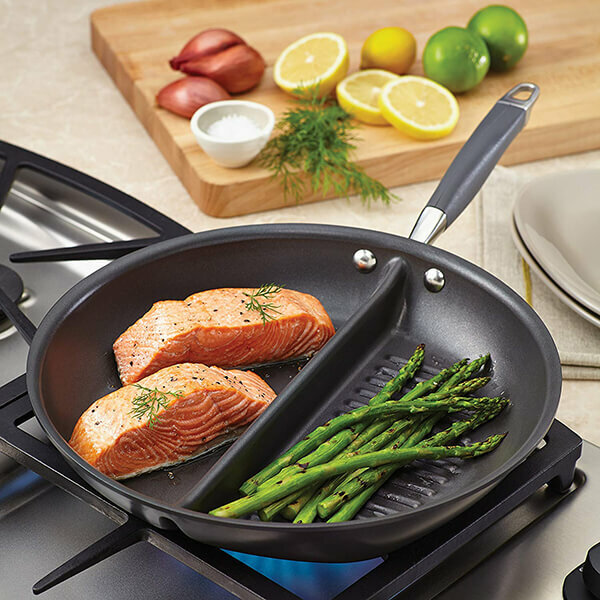 Cook u.p to 3 different foods all at once on one burner. 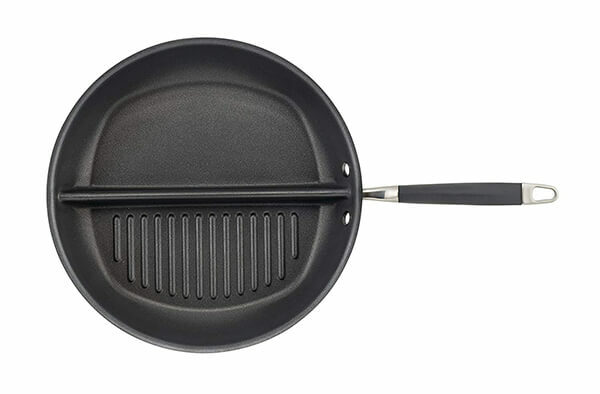 Riveted Steel handle with Silicone is oven safe to 500 Degrees. 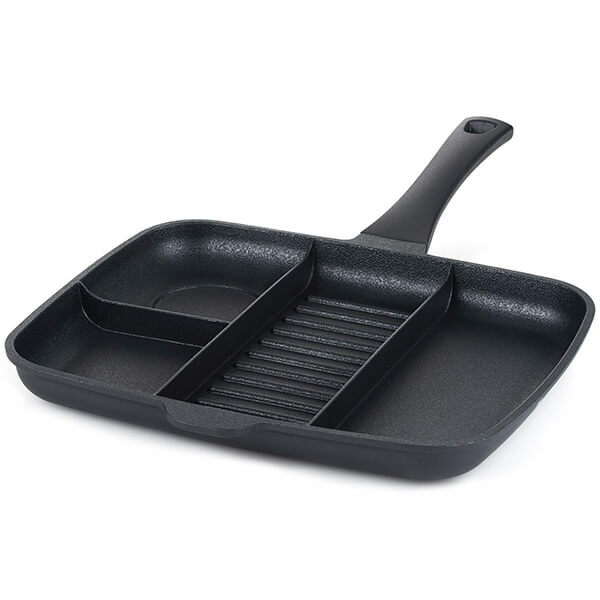 Perfect for morning favorites like grilled homemade breakfast and farm-fresh eggs, the divided grill and griddle’s heavy-duty, hard-anodized construction delivers beautifully balanced heat for searing a quick hanger steak on the grill side while fragrant baby bella mushrooms and garlic sauté on the griddle half. 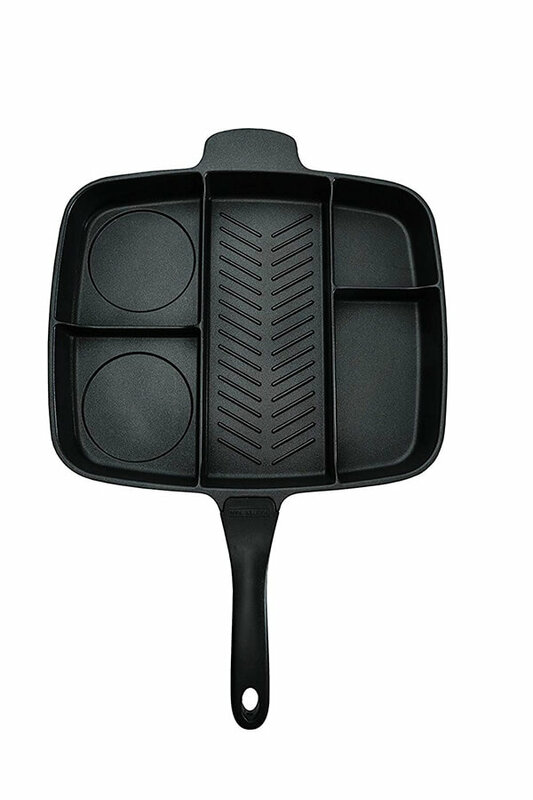 The skillet interior features durable, PFOA-free autograph 2 nonstick surface for exceptional food release and easy cleanup, and the superior-quality nonstick is metal utensil safe for the ultimate touch of cooking convenience.